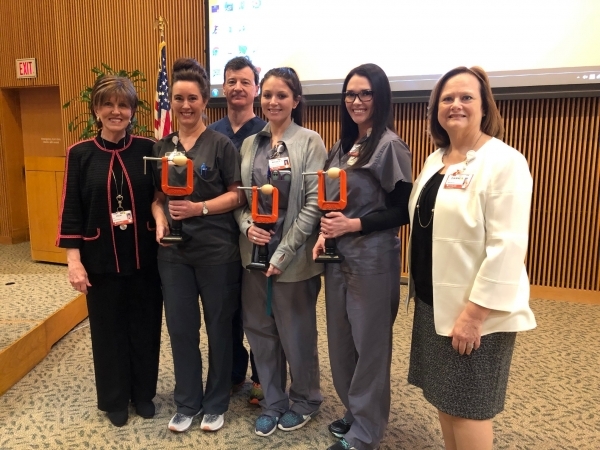 Dr. Paul Detwiler was so inspired by the team of UT Health Tyler emergency room nurses who responded to patients brought into the ER from a fatal house fire that he created a special Grace Under Pressure award that he presented to them at the hospital’s management conference this month. The emergency department received four patients – children ages 2, 4 and 7 and one adult. The ER was full that night and ER supervisor Nicole Remedies-Way immediately began clearing the three trauma bays and a medical room. The adult was transferred to Parkland; two of the children were transferred to Cook Children's and the third child was transferred to LSU accompanied by Sarah McPherson, RN, who provided care with EMS on the transport and ended up working a 22-hour shift. Dr. Detwiler was so touched by the efforts of McPherson, Remedies-Way and Angela Bowers, director of emergency services, that he created the award. He handmade the actual awards himself, which he said were inspired by the image on the cover of a Rush album with the same title. Detwiler said making the awards, which took about five hours each, was a labor of love.